Frances Sedgwick's keen eye and ear for the human condition will reveal the heart and soul of one of the country's most turbulent urban areas where the best traditions of human kindness prevail against powerful forces that would grind them down. Her critical observation combined with a tender sense of humour will provide you with something to think about, and something to talk about. This column was original published in May 2010. The third bench on King Sreett West in Parkdale, overlooking the Gardiner Expressway and Lake Ontario, was home to a homeless man. He lived there for years, at night lying on the bench in his sleeping bag. He was always well groomed, clean, and wearing a shirt and tie. Neighbours said he had been an accountant. I hadn't been to the Lake for a few weeks and one morning I thought it would be nice to go for breakfast by the water at the Sunnyside Café. I put on old jogging clothes and bounced out the door and down toward the shore. As I approached the benches facing the Lake, I couldn't see the homeless man. Instead, I saw flowers. I thought, Oh-no, oh-No! Two men were walking their dogs. I said, "Those flowers. Don't tell me it means he died?" Yes, they said, about three weeks ago. The police said he fell off the bench and cracked his head, but we think he was murdered. Oh, my God! I said. Yes, they said. The police are sticking to the story that he fell while sleeping. But there was so much blood on the ground they had to call the fire department to clean it up. The local residents are sure he was murdered. "Such a shame," said the men, "he never bothered anyone." May the Great Spirit let you rest on your bench in the sky. 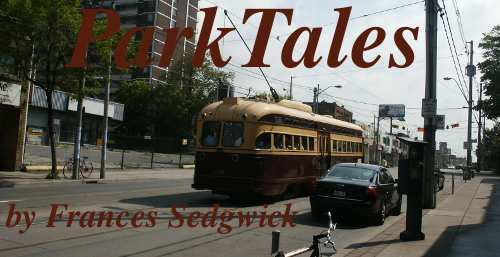 The longer poem was entitled "Third Bench on King Street West, Parkdale". I cried. I cried for this unknown person. I mourned with the community, with their outpouring of love expressed to this man through the flowers, the candles, the poems, on his bench. 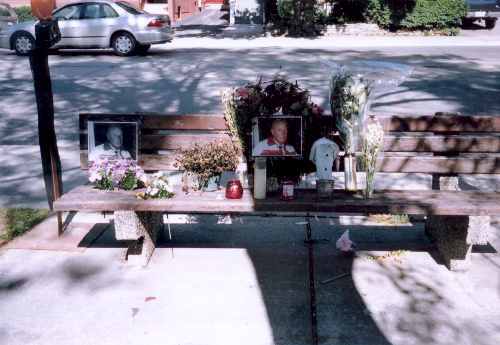 Still the flowers come three weeks after his death. New candles are lit. The bench is mourned off to let the community mourn. What a caring, loving community, I thought to myself. Parkdale.